I love this image from a 2015 wedding at the magnificent Whitley Hall Hotel in Sheffield. 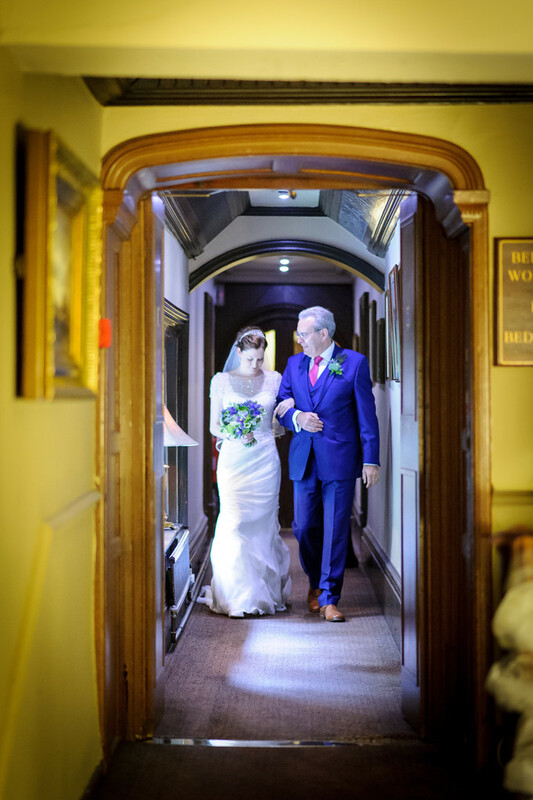 The father of the Bride escorts her along the corridor from her final meeting with the registrar and on to meet her husband to be in the ceremony room at the Whitley Hall Hotel. Her father shares a few moments together as they walk along this beautiful sun filled corridor and head for the main stairs down to reception. Whitley Hall is one of the oldest wedding venues in Sheffield and has been a hotel since the 1960's. Whitley Hall itself dates back to the 1580's but there is evidence of a previous dwelling here prior to this. We have undertaken several weddings here at Whitley Hall, of different sizes and styles, all are obviously unique to each of the couples, all meticulously planned by the happy couple and equally well presented by the staff here. There are some splendid grounds for the family formal photographs as well as some marvellous, secluded corners and hideaways for us to undertake our wedding photography duties for our couple. This really is one very special venue for couples looking for something different from the more modern hotels, one to check out for sure. 1/125; f/2.0; ISO 8000; 85.0 mm.